fCCP makes the transfer non-repudiational for both parties. Transaction sequence of fCCP in a message oriented form. The initiator uses the application software to enter information about his action and creates the request. The initiator determines the method (there are different technical methods to do that, e.g. by using an NFC/RFID, a DNS/IP entry or a MSN) for contacting the other peer using a proximity or remote connection. The initiating eWallet contacts the target eWallet. Both eWallets exchange their certificates. Both eWallets exchange key information. 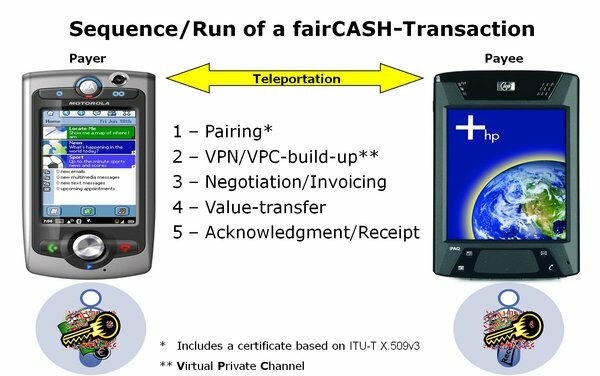 Both eWallets negotiate a VPN/VPC. Both eWallets exchange their user certificates. Both eWallets specify and acknowledge the deal. Both eWallets compare the other’s eWallet identity with the intended one. Both eWallets authorize or decline the deal. The eCoins of the main payment are transferred. The eCoins of the change payment are transferred. The acknowledge tickets are sent. Both eWallets inform their respective users about the money transfer status. Both eWallets terminate the connection. 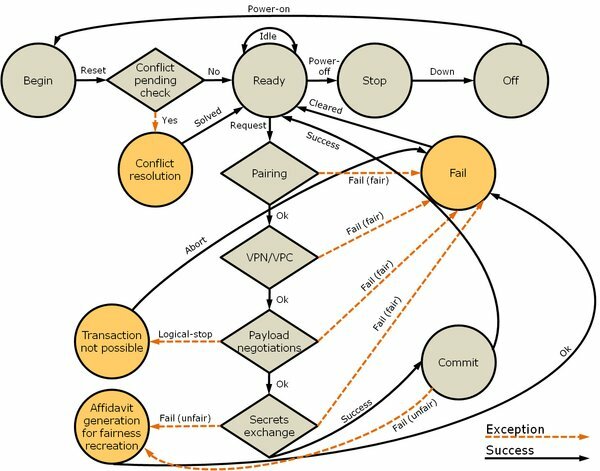 Mealy state-machine (FSM) transition-flow of an eWallet. Transaction protocol runtime calculations for different networks.